Photographs by John Salmon. You may use these images without prior permission for any scholarly or educational purpose as long as you (1) credit John Salmon and (2) link your document to this URL in a web document or cite the Victorian Web in a print one. Click on all the images to enlarge them. 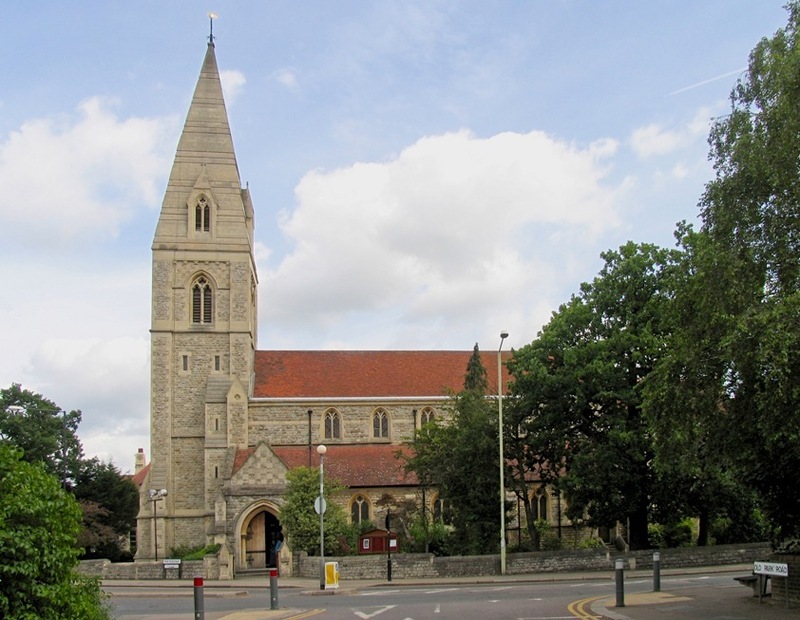 The Church of St Mary Magdalene, Windmill Hill, Enfield, by William Butterfield (1814-1900). 1881-83, with chancel decoration of 1897-99 by Edward Turner of Bowling Green Street, Leicester (see details under "Chancel"); and a Lady Chapel added in 1907-08. The materials were traditional — Kentish ragstone with Bath stone dressings, sandstone for the aisle pillars, and red clay tile for the roofs (see listing text), the main distinction of the exterior being simply the uninterrupted rise of the tower to the spire, enhancing the typical "solid geometry" of a Butterfield church (Cherry and Pevsner 437). The nearest Butterfield gets here to the eye-catching polychromy of his more famous All Saints, Margaret Street is in the banding of this tower and pyramidal spire, and the checkered patterning of the south porch gable, and of the chancel gable too. There was, perhaps, no need for more pronounced effects: unlike All Saints, the church is not tucked away but situated on a rise, already prominent from its location alone. The architect's subtler, lighter touches give St Mary Magdalene a very pleasing appearance. It is of considerable interest as a late work by William Butterfield in the Gothic revival style of the late 13th century. *It has a spire of dramatic geometry and which forms an important landmark. 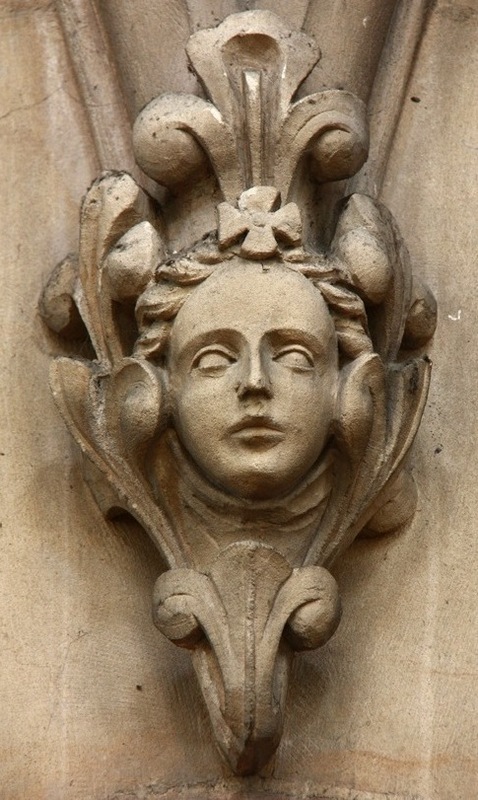 *It contains extensive fittings which are original to Butterfield's building and which are characteristic of his work. 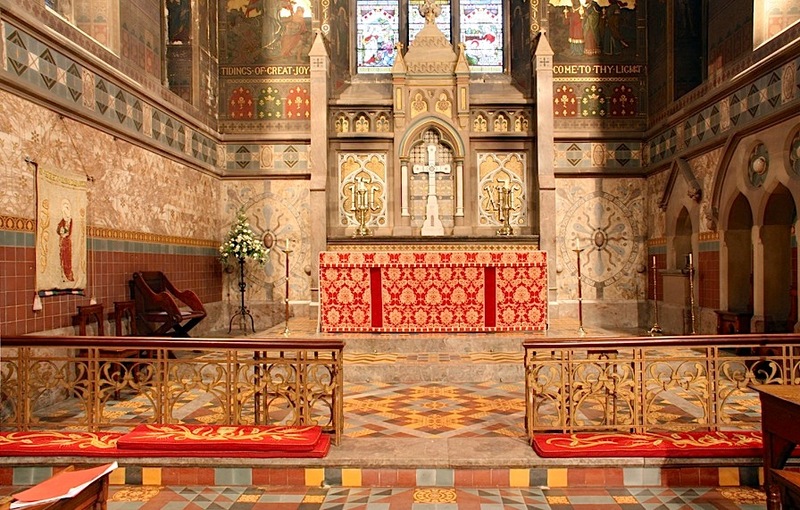 *It has been much enhanced by a lavish scheme of chancel decoration in the 1890s. Not mentioned is anything about the basic design, which is simply that of a south porch, nave with circular columns, lean-to aisles, and chancel — without even the Lady Chapel, to begin with. 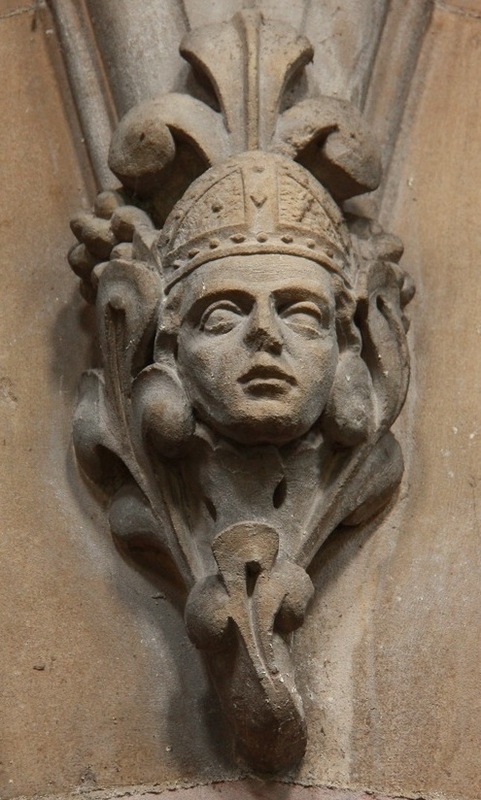 But again there are subtleties, such as these corbels supporting the round columns of the nave, very much in the Gothic tradition, and of the era favoured by Ecclesiological Society (which had taken Butterfield up in the 1840s). The kneelers here make such a colourful addition to the seating and whole atmosphere. Butterfield had a special dislike of tatty kneelers, as seen in his pamphlet on Church Seats and Kneeling Boards (p. 4), but his heart would surely have been warmed by these, each clearly a labour of love. The church's patron was Georgiana Twells, who built it in memory of her husband Philip, a former banker and City of London M.P., after his death in 1880. The later chancel decoration was also her gift to the church, in celebration of Queen Victoria's Diamond Jubilee. Philip and Georgiana Twells were High Church Anglicans like Butterfield himself, so here was another case in which religious affiliation brought out the best in the Gothic Revival and Arts and Crafts nexus of the later Victorian period — a segueing of the High Victorian into quieter exterior forms with emphasis on applied decoration, rich in colour and refined in skills (including embroidery), which would be uplifting rather than strident. Left: The chancel, as eventually decorated after Butterfield's own involvement with the church. 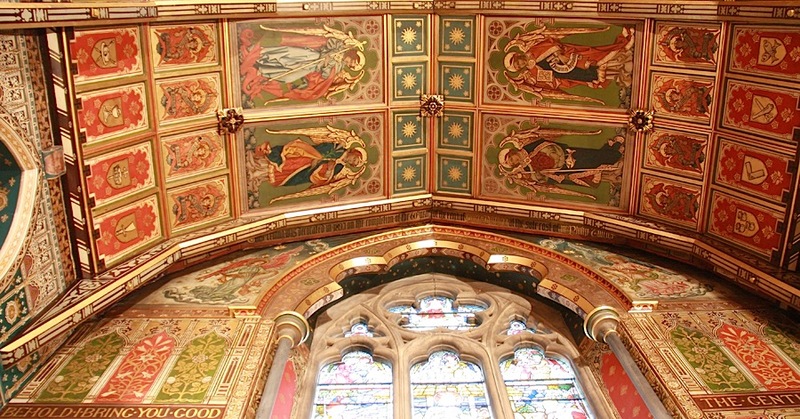 Right: The roof of the chancel, and the east wall, richly painted by Charles Edgar Buckeridge, and recently restored. 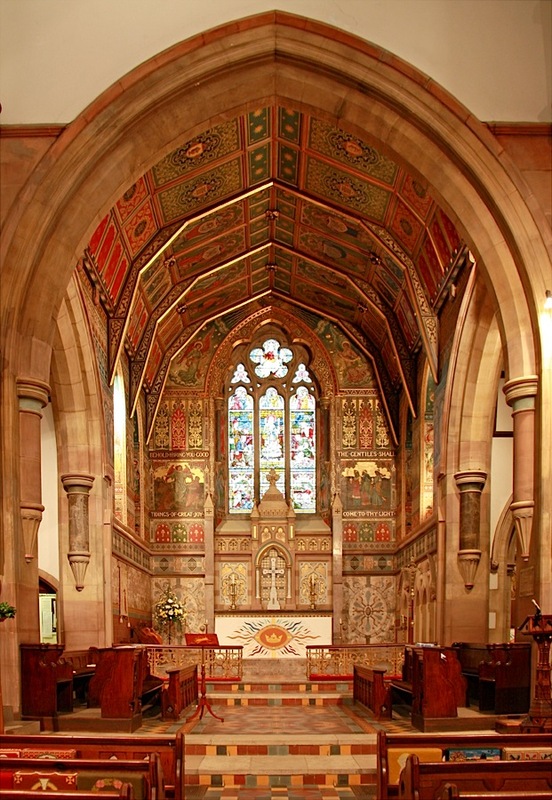 In the chancel, the architect Edward Turner of Bowling Green Street, Leicester, worked with the church decorator Charles Edgar Buckeridge (1864-98), who painted the ceiling angels, and Nathaniel Westlake, the well-known stained glass designer, who painted the north and south walls. Buckeridge, son of the architect Charles Buckeridge, had trained with ecclesiastic decorators Burlison and Grylls, "and rose to be a highly esteemed painter in this field" (Saint 363), though his life was a troubled one and he died before the chancel was completed — hence perhaps Westlake's commission for the side walls. The turn of the century was the age for enriching chancels in the Byzantine manner with painted panels and much gilding. Although the decoration here is in a vaulted chancel rather than on a domed basilica, it is very striking. The church's own website describes the "extensive use ... of gold ragged stars on a blue background, and white roses on a red background, " adding: "There are gold shields on which the letters 'HIS' appear, and two gold shields carrying a pot of ointment, the symbol of St. Mary Magdalene." It is fascinating to see how the secular Arts and Crafts movement has been co-opted into the service of mystic High Church symbolism, and has overlaid the relative simplicity of the Gothic Revival structure with such brilliance (see Alan Crawford on this kind of convergence elsewhere, and, as he says, the "cross-fertilisation" between sacred and secular art, 77-78). 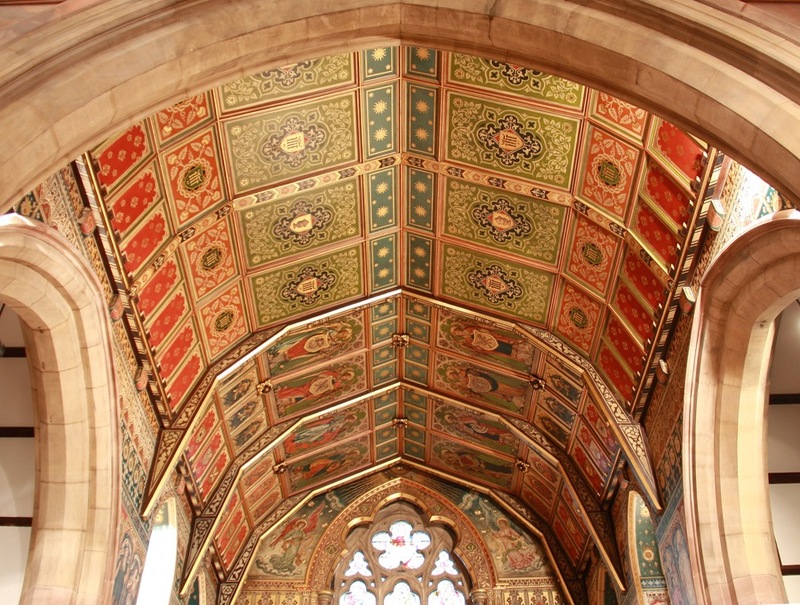 But, thinking back to the heavily gilded and patterned interior of Pugin's St Giles, Cheadle, the development is not really surprising at all. The sanctuary, close up, in all its glory. Not to be passed over here are the contributions made by the splendid stained glass windows, many of which (including both east and west windows) date to Butterfield's day and would have been executed for the architect himself; his colourful, geometrically patterned Minton floor tiling; and his reredos — not elaborately carved with figures, but suitably architectural in form. Then as now, the altar frontal would have provided another show of colour, emphasising this high point of the chancel: for details about two of the original frontals, used at different times of the church year, but too fragile to be hung now, see Part II. 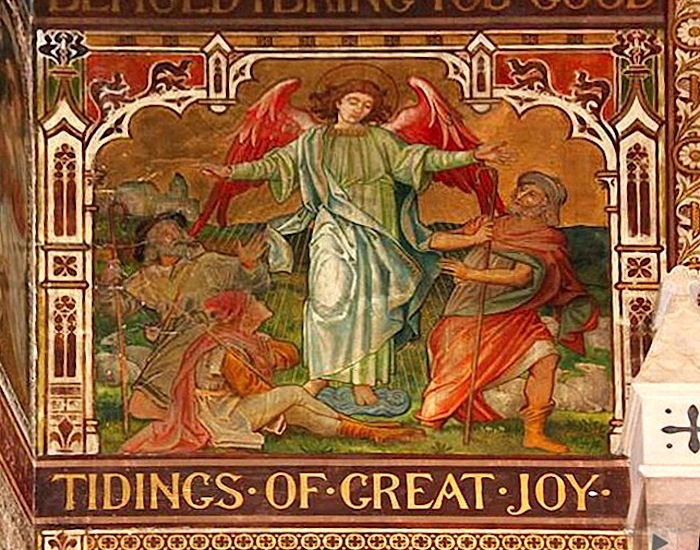 Buckeridge's wall paintings on either side of the altar illustrate the texts, "Behold I Bring You Good Tidings of Great Joy" and "The Gentiles Shall Come to Thy Light," with depictions of (left) the angel making his dramatic announcement to the shepherds, with red wings half-spread and arms outstretched, and (right) the Three Wise Men following the star towards the stable with their gifts. These appropriately flank the east window, made up for Butterfield in about 1883 by Heaton, Butler and Bayne, and showing the nativity. Left: Closer view of the roof of the sanctuary, with the figures of angels by Buckeridge. Right: Sanctuary, showing the three-light east window in its full setting. According to the church's own website again, the ceiling figures here depict "the whole company of angels from cherubim to archangels, ... with symbols of the Church — a dragon, a lily, a fish and staff, a book and scroll," while the red-winged seraphim below the archangels hold scrolls inscribed with the words "Sanctus, Sanctus, Sanctus." The archangels are flanked by the four angels of the Passion, and below are the cherubim, distinguished by their blue wings — and below them again are sixteen panels showing golden shields with symbols of the Church or the Apostles. There is a great deal of painted arcading, gilding and very close detailed work, for example in the angels' features. 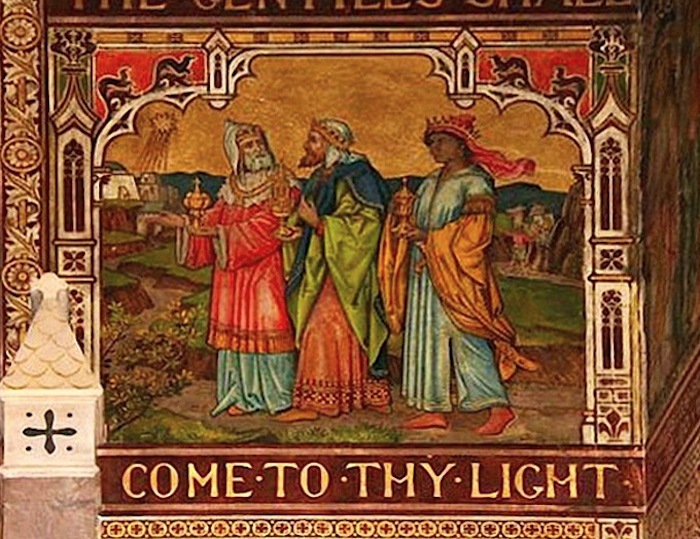 Left: Detail from the central panel of the east window by Heaton, Butler and Bayne, to the designs of Butterfield himself. 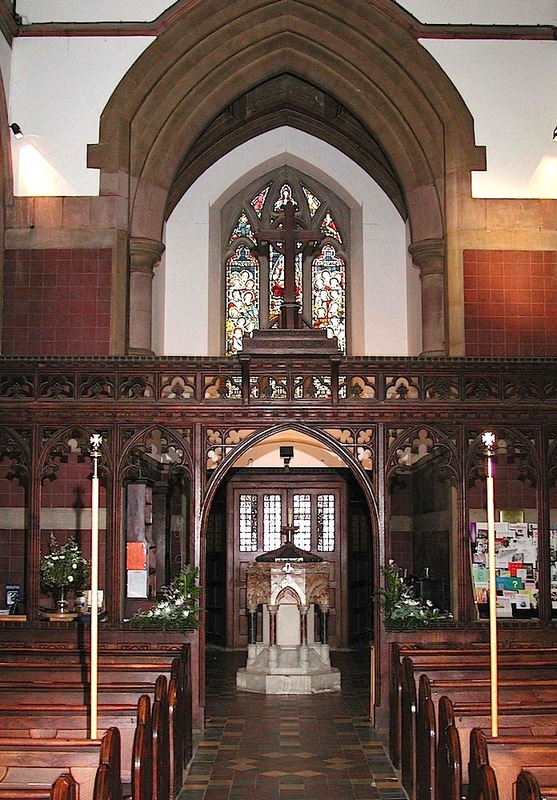 Right: West end of the church, showing Butterfield's wooden chancel screen, now framing the font instead of impeding the view of the chancel. All this decoration, with its emphasis on the apostles, saints and the authority of the church, harking back to early Christianity, does indeed mark St Mary Magdalene out as High Church. As mentioned above, Butterfield, as perhaps the most distinguished of all High Church architects, had been the obvious choice for the original commission. His later work was less distinctive: as Rosemary Hill says, "there is a lessening of elaboration." However, added to his own window and floor designs, the lavish treatment of the chancel compensates for this here, and more than entitles the completed church to its high listing status. Baker, T. F. T., and R. B. Pugh, eds. "Enfield: Churches." In A History of the County of Middlesex: Volume 5. London, 1976. British History Online. Web. 1 July 2015. Butterfield, William. Church Seats and Kneeling Boards. London: Rivingtons, 1886. Internet Archive. Contributed by the University of Illinois Urbana-Champaign. Web. 1 July 2015. "The Chancel. The Ceiling." St Mary Magdalene. Web. 1 July 2015. "Chancel Restoration Project." St Mary Magdalene. Web. 1 July 2015. Cherry, Bridget, and Nikolaus Pevsner. London 4: North. New Haven and London: Yale University Press, 2002. Crawford, Alan. "Arts and Crafts Churches." 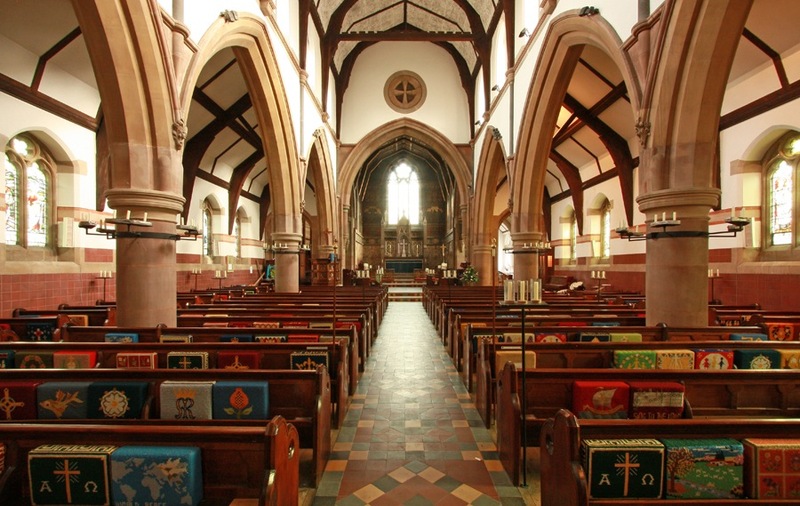 In Churches 1870-1919, the Victorian Society's journal, Studies in Victorian Architecture & Design. 3 (2011): 63-79. Eberhard, Robert. "Stained Glass Windows at St Mary Magdalene." Church Stained Glass Windows. Web. 1 July 2015. Edward Turner, Architect. (This gives his location.) Shropshire Archives. Web. 1 July 2015. List Entry for St Mary Magdalene. Historic England. Web. 1 July 2015. Newman, John, and Nikolaus Pevsner. Shropshire. Buildings of England series. New Haven and London: Yale University Press, 2006. (Edward Turner had several commissions here). Saint, Andrew. "Charles Buckeridge and His Family." Oxoniensia 38 (1973): 357-72, plus plates. 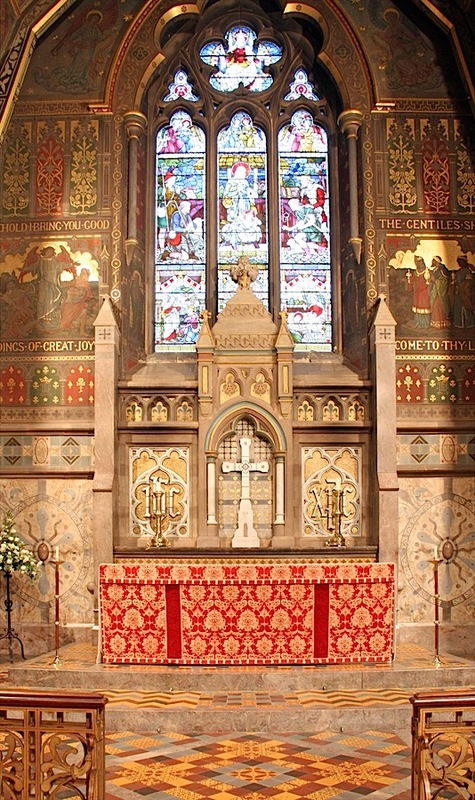 Plate XXIX gives a good example of Buckeridge's recent and most celebrated decorative work, a beautifully painted reredos of 1892-93 at All Saints Church, Richards Castle, Shropshire. Web. 1 July 2015.